Dr. Landon Blatter is an expert in restorative, TMJ, cosmetic, Invisalign and implant dentistry. He performs comprehensive treatment for the entire family in his Aspen Springs Dental and his Aurora Family Dentistry practices. Dr. Blatter is an avid user of digital and laser dental technology to improve the dental and oral health of his patients. Dr. Blatter is honored to have been in the 5280 MAGAZINE’S Top Dentist’s of Colorado special editions for the last several years. He is very grateful when his fellow Denver dentist’s and specialist’s select him to be recognized as a leader in restorative and implant dentistry. Dr. Blatter received his dental degree from the Harvard School of Dental Medicine, and received his B.S. degree in Business Management from Brigham Young University. He has taken extensive Continuing Education courses in Comprehensive Dentistry, TMJ Dentistry, Implant Dentistry, Smile Design, Root Canals, Periodontal Disease, Occlusal Disease, Restorative Dentistry and much more. He graduated from the Dawson Academy for Comprehensive Dentistry last year and continues his dental implant education through 3I’s Synergy Training Program multiple times a year. Since graduating the Dawson Academy, Dr. Blatter is now part of their teaching faculty. Dr. Blatter is a current member of the American Academy of Cosmetic Dentistry, American Academy of Craniofacial Pain, The Dawson Academy, American Dental Association, Colorado Dental Association, and the Metropolitan Denver Dental Society. He and his family are active in the community as volunteers in scouting and other religious and civic organizations. He and his wife are the proud parents of four children. Dr. Blatter loves the outdoors, hunting and baseball. 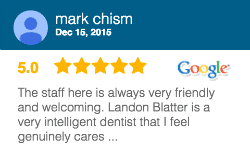 Dr. Blatter has been a 5280 top dentist since 2009!